LIHUE » Kauai Mayor Bryan Baptiste, who Mayor Mufi Hannemann nicknamed "Mayor Aloha," died yesterday of an apparent cardiac arrest. He was 52. In a statement last night, Kauai County officials said paramedics were called to Baptiste's home, where they tried unsuccessfully to resuscitate him. He was pronounced dead at Wilcox Hospital. LIHUE » Kauai Mayor Bryan Baptiste, who was recovering from heart bypass surgery earlier this month, died at Wilcox Memorial Hospital yesterday after suffering an apparent cardiac arrest. He was 52. Paramedics responded to a call at Baptiste's home but were unable to resuscitate him, Kauai County officials said last night. 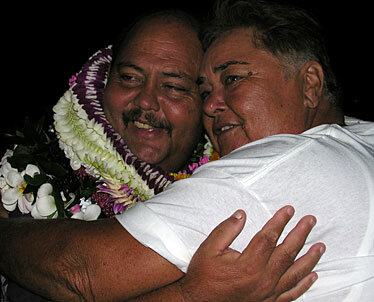 Kauai Mayor Bryan Baptiste hugged supporter Rosie Bukoski at a celebration held for Baptiste at the Lihue Community Center in September 2006. Baptiste, a Republican who was in his second term, was remembered as a hard-working public servant who embodied the spirit of aloha. "Leadership from the heart" was Baptiste's first mayoral campaign slogan. "This is a huge loss for Kauai," said Tim Bynum, a Kauai County councilmember who served on Baptiste's staff during his first term. "He's been a great mayor and he's been a good person. I think that he was a really caring leader that did his best for Kauai to maintain the uniqueness of our island. He'll have a lot of legacies." Honolulu Mayor Mufi Hannemann said in a news release that he was stunned by the news of Baptiste's death. "Kauai has lost a great leader, and I have lost a dear friend and colleague," he said. "I thought he was 'Mayor Aloha,' in that he exuded a unique local style of leadership. Bryan was quick to smile, put people at ease, and said just enough to get his point across, yet make people feel comfortable with a decision-making process. I'll miss him very much, as I know the people of Kauai will. We've lost an outstanding public servant." Baptiste underwent cardiac bypass surgery June 13 at the Queen's Medical Center and was released Friday. He stayed with Gov. Linda Lingle before and after the surgery, according to her office. "Bryan and I had spent time yesterday (Saturday) watching a college baseball game and marveling at the divers competing in the Olympic trials. We had talked about the bills I was considering signing and those I might veto, including the bill regarding Kokee cabins on Kauai," Lingle said in the statement released yesterday. Lingle said she took him to the airport about 8:30 p.m. Saturday. He returned home and was "resting comfortably when the incident occurred," the Kauai County statement said. Baptiste's administrative assistant, Gary Heu, is serving as mayor pro tem. He will meet with county officials today to determine the next course of action. Under the Kauai County Charter, the seven members of the Kauai Council will select an interim replacement from among their ranks. An election will be held in November for a successor to fill out the remaining two years of his term. The council vacancy will be filled by appointment by the remaining six members. A routine checkup earlier this month led doctors to recommend heart surgery. Before serving as mayor, Baptiste was a convention hall manager and he wrote a column for the local newspaper about the people working together to improve the community, Bynum said. 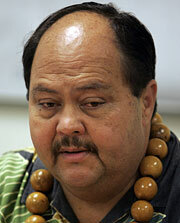 Baptiste was re-elected Kauai mayor in the 2006 primary election with more than 50 percent of the vote. He served on the Kauai County Council from 1996 until 2002. "It's a real sad day for our community," said Sen. Gary Hooser (D, Kauai-Niihau), who served with Baptiste on the County Council and had known the mayor for about 15 years. "We're going to miss him dearly. Mayor Baptiste was a good man, an incredibly hard working person who cared deeply about the community. That's why he did the job to serve the people." He added, "He literally wore his heart on his sleeve," recalling Baptiste's slogan. "That's how he led. He led with his heart, a passionate, very caring person. He will be missed by all of us." Hooser said Baptiste would be remembered for community outreach, establishing groups around the island. "He worked on community projects like the coastal path — his dream was to have paths around the island for all people to use," he said. Survivors include his wife, Annette, and four children: Brandon, Heather, Lauren and Preston. Services are pending. Lingle has ordered that state flags be flown at half-staff at state and county buildings on the day of Baptiste's interment. Additional condolences for Kauai Mayor Bryan Baptiste were offered from elected officials in the islands and Washington, D.C.
"Mayor Baptiste was a dear friend. While we belonged to opposing political parties, I enjoyed working with Bryan and I always knew his heart was in the right place. The people of Kauai have lost a champion." "Bryan was a humble man who never lost sight of the fact that as a politician, he was there to serve the people, not the other way around. He was a leader with great integrity and always cared more about doing what was right for Kauai and making a difference in people's lives than receiving credit or taking the limelight. I will miss Bryan's friendship, his sense of humor and his caring spirit. He was a true friend. It is hard to believe he is gone." "This is sad news. Mayor Baptiste will be truly missed. He had a pointed sense of humor that made everyone listen carefully to what he said. We had a wonderful relationship and I will really miss him. My heart goes out to his family as they deal with this unexpected passing. I respected his commitment to the people of Kauai, and is absence on the Hawaii Council of Mayors will be felt by many." "Although we were members of different political parties, we were able to effectively work together as partners on many projects. Those projects included highway and bridge improvements, fighting crack cocaine and other illicit drugs, and helping the homeless. The passing of Mayor Baptiste is a great loss for Hawaii, and especially for Kauai."